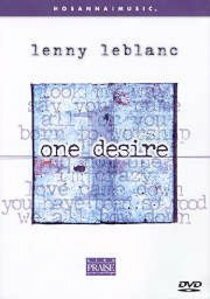 Recorded live at the Church of the Apostles in Atlanta, Georgia, One Desire features renowned musician, songwriter and worship leader Lenny LeBlanc. Endearing lyrics found in songs like "We All Bow Down," "Only Love" and "One Desire" inspire you to devote your life to following the Savior. You cannot deny God's powerful presence as He capture your heart in this night of upbeat praise and intimate worship.